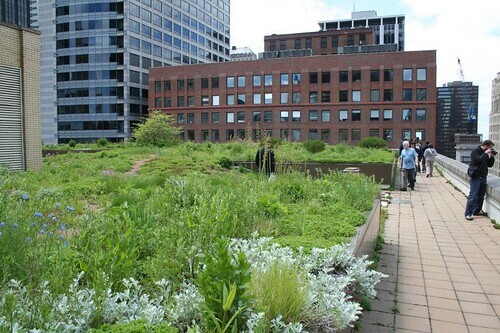 Among the many tours offered last weekend as part of the Great Spaces program was a trip to City Hall’s green roof. I though it’d be interesting… it turned out to be awesome. 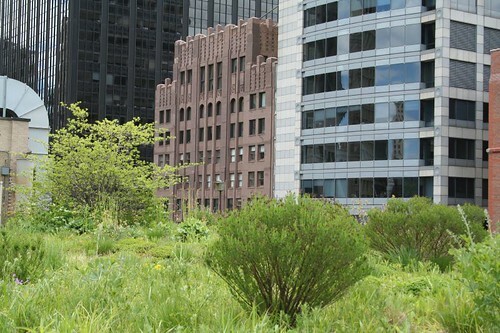 It’s not just some little patches of grass up there, folks; it’s a veritable garden — a little slice of prairie twelve stories above the street, planted with native grasses and flowers intended to survive the harsh conditions inherent to Chicago. Paths marked by concrete pavers wind through the garden and over its gentle rolls and rises. Magnificent buildings surround it on all sides, creating a dizzyingly grand space. According to the city’s architect (our tour guide), the roof has been a smashing success. It’s saved the city money on heating and cooling costs. 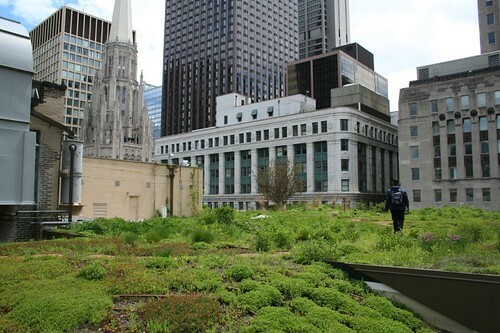 It’s only had one leak in the 8 years or so since its installation, and the vegetation cover actually protects the roof membrane from sunlight and other weathering. 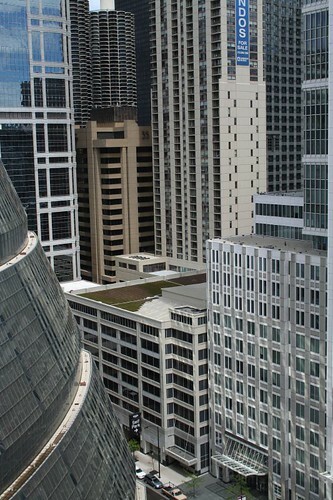 Necessary paraphernalia like vent stacks are simply extended up beyond the level of the soil and vegetation; most other HVAC equipment is out of the way in a central penthouse. A couple of trees are strategically located over structural columns to avoid loading issues. The entire building was designed with a mind toward adding more floors (though it never happened), so the structure in general is up to the extra loading. 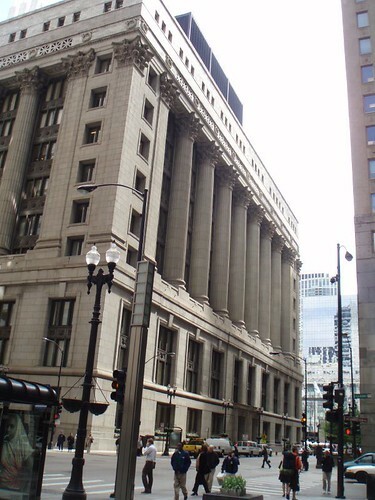 “City Hall” is actually two structurally and functionally independent buildings behind a united facade. 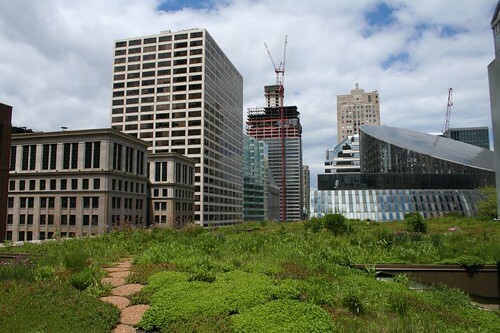 The eastern half is home to Cook County administration… and its roof never got the green treatment. It still retains its old black rubber roof, and looks sad and desolate by comparison. A chain-link fence separates the two roofs. It’s truly a shame that this flabbergasting space is only open on rare occasions. If it had elevator access and two fire exits, it’d be the perfect setting for a garden cafe. 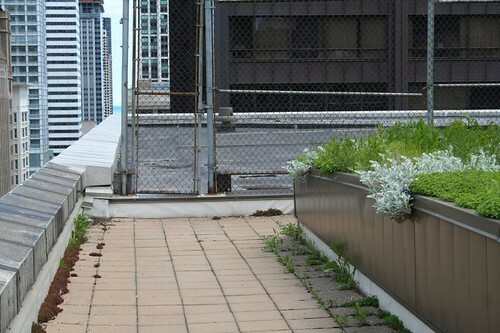 This entry was posted in Life in Chicago, Parks, The Loop. Bookmark the permalink.